The market environment in Q3 was marked by a widening divergence in performance between U.S. and international investments, with U.S. stocks surging to new highs while most other asset classes were relatively flat or down. Environments where one asset class dominates performance can occur from time to time. In these periods, it’s important to stay focused on your longer-term goals and avoid the temptation to chase after the strongest performing asset class, a painful lesson learned by many investors who piled into technology stocks in the late-1990s. While international investments have underperformed in 2018, they have outperformed in other periods. Over time, global diversification is designed to deliver competitive risk-adjusted returns while helping moderate the ups and downs along the way. Fundamental indexing proved its power of diversification during the quarter, delivering positive returns in emerging markets that more than offset declines for its market cap counterpart. Portfolio returns were modest during a challenging quarter for global asset allocation, with more aggressive portfolios outperforming more conservative portfolios due to their larger allocations to U.S. stocks. How did financial markets do in Q3 2018? The third quarter of 2018 saw a widening divergence in performance between U.S. and international investments. In the U.S., strong corporate earnings and overall economic growth pushed stocks to new highs. The S&P 500® Index surged 7.7% in its strongest quarterly gain since the fourth quarter of 2013. By contrast, international developed market stocks rose a more modest 1.4%, while emerging markets stocks declined 1.1%. For the YTD period, the biggest drag on performance has been emerging markets, which have been pressured by concerns about trade and economic growth, high debt levels, geopolitical turmoil, and the headwind of a stronger U.S. dollar. After being routed during the summer, emerging markets appeared to have stabilized as Q3 came to a close and the currency headwinds abated—but were still down 7.7% YTD. Gold has also been among the weakest performers in recent quarters, pressured by both the stronger dollar and rising interest rates, though it represents a very small allocation within Schwab Intelligent Portfolios. While short-term periods of underperformance by international investments might tempt you to question the benefits of global diversification, keep in mind that international investments were among the top performers in 2017 and U.S. investments can underperform for extended periods as well. For example, the decade of the 2000s has come to be known as the "lost decade" for U.S. stocks because the S&P 500 delivered little to no return for the entire decade while international investments were at the top of the performance rankings. Global diversification is designed to spread investments across different asset classes and geographies to help moderate volatility over time and keep you focused on your longer-term goals. This diversified approach helps ensure that your portfolio holds some of the top performers at any given time while not being overly concentrated in the bottom performers as different asset classes move up and down the performance rankings. Source: Morningstar Direct, as of September 30, 2018. Performance figures shown are total returns for each asset class during the designated period. Indexes used are U.S. large cap stocks, S&P 500® Index; U.S. small cap stocks, Russell 2000® Index; high-yield bonds, Bloomberg Barclays High Yield Very Liquid Index; international developed market large cap stocks, MSCI EAFE Index; U.S. real estate investment trusts, S&P United States REIT Index; investment-grade corporate bonds, Bloomberg Barclays U.S. Corporate Investment Grade Index; international bonds, Bloomberg Barclays Global Aggregate ex-USD (Hedged) Bond Index; U.S. Treasuries, Bloomberg Barclays U.S. Treasury 3-7 Year Bond Index; emerging markets debt, Bloomberg Barclays Emerging Markets Local Currency Government Bond Index; Treasury Inflation Protected Securities, Bloomberg Barclays U.S. Treasury Inflation Protected Securities Index; international small cap stocks, MSCI EAFE small cap Index; emerging markets stocks, MSCI Emerging Markets Index; gold and other precious metals, S&P GSCI Precious Metals Index. Past performance does not guarantee future results. Indexes are unmanaged and cannot be invested in directly. 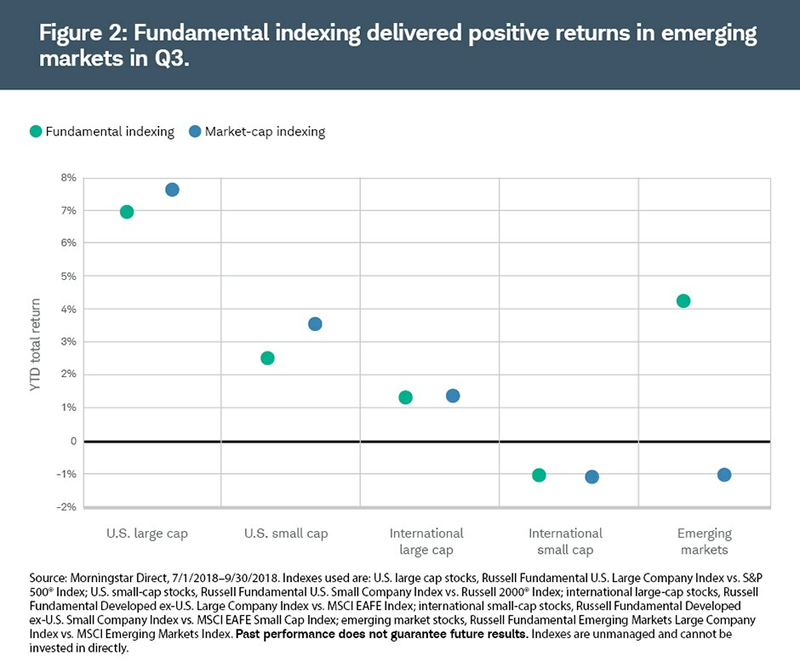 While traditional emerging markets indexes were weak during Q3, fundamental indexing proved its power of diversification during the quarter.2 In emerging markets, fundamental indexing was among the top performers with a gain of 4.2%, more than offsetting the decline for its market cap counterpart. For the year so far, fundamental indexing has outperformed market cap indexing in emerging markets and international large cap stocks, while market cap indexing has led in the three other major equity asset classes. Schwab Intelligent Portfolios uses both forms of indexing for additional diversification within the five major equity asset classes. Each of these forms of index investing tends to lead in different market environments, so including both within a portfolio can enhance diversification while retaining the benefits of indexing such as low costs, transparency and tax efficiency. Portfolio performance over the course of 2018 has illustrated the benefits of taking a broadly diversified approach. During the market correction that occurred during the first quarter, diversification helped moderate overall portfolio declines as U.S. stocks fell sharply. By contrast, in the third quarter as U.S. stocks rallied while most other asset classes were relatively flat or down, diversified portfolios would not be expected to keep up with the single best-performing asset class. As would be expected, more aggressive portfolios outperformed more conservative portfolios during Q3 due to their larger allocations to U.S. stocks, while moderate and conservative portfolios outperformed during Q1. This is the purpose of diversification. Stocks are highly volatile and might perform well in one period and poorly in another period. While your portfolio might be ahead of or behind a U.S. stock index such as the S&P 500 at any given time, diversification is designed to help moderate these ups and downs so that you can stay focused on your longer-term goals. Many investors who piled into technology stocks in the late 1990s as they surged higher learned this painful lesson as stocks plunged precipitously in the following years. Staying focused on your goals and ignoring the short-term noise are among the keys to long-term investment success. While returns have been moderate in 2018, portfolios have delivered competitive returns over the longer term across the risk spectrum. Knowing which type of portfolio is most appropriate for you is a matter of understanding your goals and risk tolerance. Schwab Intelligent Portfolios is designed to recommend a portfolio consistent with your objective, time horizon and ability and willingness to take risk. Whether you're invested in a more conservative or more aggressive portfolio is based on your answers to our online investor profile questionnaire. We recommend that you revisit the questionnaire at least annually to ensure that your portfolio continues to be suitable based on your current goal, time horizon and risk tolerance. As we move into the final quarter of 2018, the U.S. economy remains strong and business confidence is solid. At the same time, market valuations are elevated, investor sentiment has risen to potentially overly optimistic levels, and uncertainties remain regarding trade policy and other geopolitical issues. While a recession does not appear to be looming on the near-term horizon, risks have increased and Schwab has moved to a more cautiously optimistic stance. Market gains might be more muted in coming quarters, with potential gains likely accompanied by some bumps along the way as we move into the later stages of the economic cycle. Going forward, it's important to maintain a disciplined approach focused on your longer-term goals while ignoring short-term market noise. Investing in a diversified portfolio consistent with your goals and risk tolerance and maintaining the discipline to stick with your longer-term financial plan as markets fluctuate are among the keys to long-term investment success. With up to 20 asset classes in any single portfolio and automated rebalancing, tax-loss harvesting and goal tracking, Schwab Intelligent Portfolios is designed to recommend a diversified portfolio consistent with your risk profile. Schwab Intelligent Portfolios can help manage your portfolio with discipline to help keep you on track toward reaching your financial goals. 2. As an additional layer of diversification, Schwab Intelligent Portfolios splits the allocation between a market cap weighted ETF and a fundamentally weighted ETF for the five major equity asset classes: U.S. large cap stocks, U.S. small cap stocks, international large cap stocks, international small cap stocks and emerging markets stocks. For more information on Fundamental Indexing, see https://intelligent.schwab.com/public/intelligent/blog/fundamentally-weighted-etfs.html.